Our ‘Business Champions’ manage their work-related road risk effectively and have seen clear benefits from doing so. Their success in reducing collisions has brought them a range of benefits including lower insurance premiums, improved fuel efficiency, improved reputation and even reductions in recruitment costs due to lower staff churn because they are now better places to work. Crucially, they have agreed to share their stories and act as an inspiration to other businesses. Business Champions get to take part in our events and network with peers, industry experts and other elite businesses at this level. If you would like to become a Business Champion, you must be able to clearly demonstrate business benefits that have stemmed from their successful management of those employers who drive for work. A ‘top down’ commitment to managing work-related road safety with a positive attitude and safety culture reflected throughout the organisation. A statement from the business MD or CEO supporting reinforcing this commitment should be shared with staff. 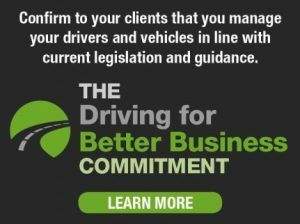 I consent to you sending me resources and relevant information about the Driving For Better Business campaign. We do not share your email address with other organisations.